Ask for our free clothing catalog! 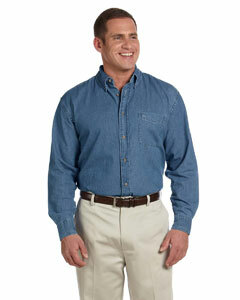 Harriton 100% cotton denim shirts, 6.5 oz., fully constructed front placket, horn-style buttons, double-needle topstitching. Colors: light denim, dark denim and washed black. These come in short sleeves and long sleeves. Sizes: S, M, L, XL, XXL, XXXL. The pricing shown below includes your embroidered design or logo up to 10,000 stitches in one location. One time tape charge: about $75.00 depending on complexity of design. Add $1.50 for XXL, $2.50 for XXXL. The ladies' denim shirt comes only with long sleeves. Washed black not available on short sleeve shirts.